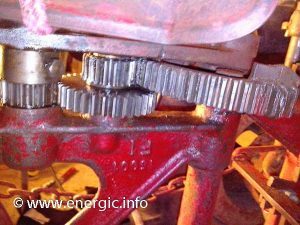 Energic developed a new range called the “Mototracteur”. This model available in Diesel and petrol was a 1/2 way house to a tractor from a motoculteur it offered a articulated system. 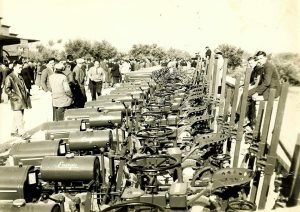 The mototracteurs articulation offered the maneuverability of a motoculteur, with similar running cost coupled with a seated position for the operator, as a tractor. 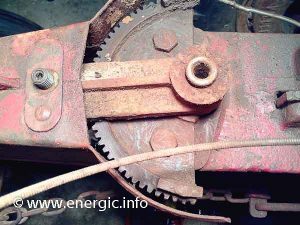 However it was found under normal working conditions the Energic mototracteurs where too light in weight on the all important rear where the plows, harrows and other implements are attached. They had to be heavily weighted down. 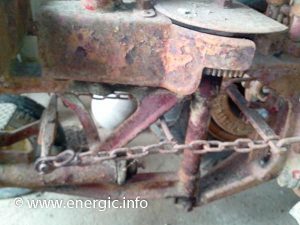 The consequence of this was that the engines in these Energic mototracteurs where worked hard. The petrol engined version was prone to the cylinders distorting to a oval, with subsequent loss of compression. 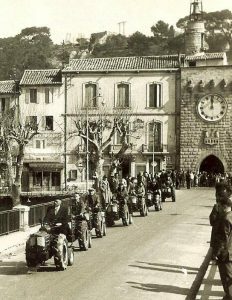 In the mototracteur sector they met stiff competition from a better weighted, equipped and designed mototracteurs from Staub and other manufacturers of the time. 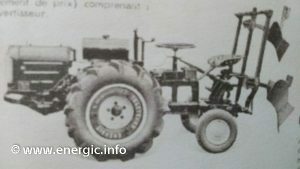 The Energic mototracteur 712 range was subsequently only produced in small quantities and for a relatively short period of time. 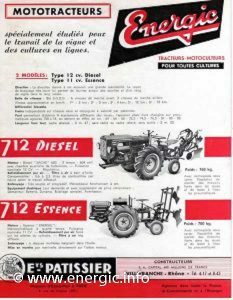 The mototracteur range was replaced by the new 4RM/4WD range in 1963. I have a record from 3/1963 from the factory with prices for the 712 range, which where for sale along side the 4RM ranges.